This Halloween we are giving your children a chance to win a luxury party bag packed full of goodies, including a pack of 3 Tinti Magic Bath Bombs, a 20-track party music CD, and assorted Halloween goodies and party bag fillers. The competition has two age categories (3 - 5 , 6 and over). One winner from each category will receive a filled party bag worth £20.00. All you have to do is send us your child's artwork. Full details of how to enter and the competition rules can be found here. It's not too early to start planning your Halloween party, so we've come up with a few ideas to help you along the way. Change all the lightbulbs for green bulbs (or make green lampshades) and cut out lots of spooky shapes in black paper to cover the windows - the effect from outside is amazing. Alternatively, decorate with halloween spooky cutouts or pumpkin cutouts. Make a fake grave in the garden with a hand covered in blood (red paint) coming out of the ground. Make the hand by pouring plaster into a rubber glove. Add red food dye to a water feature so it looks like blood bubbling up. Click on these links for more ideas for Halloween party games and Halloween party food at Funky Dory Party Bags. Today it be National Talk Like a Pirate Day , aaaaaaaaar! What better way to celebrate NTLAPD (apart from talking like one of course - although I always end up sounding more like a Wurzle!) is to have a ......... yes, you've guessed it......Pirate Party! 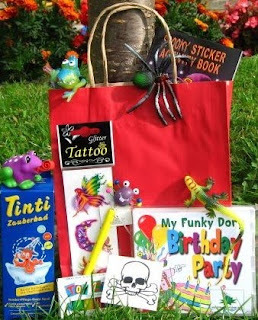 If you DO happen to be throwing a pirate party any time soon, we have lots of pirate party bag goodies to keep the kids happy! Aaaaaaaaaar! 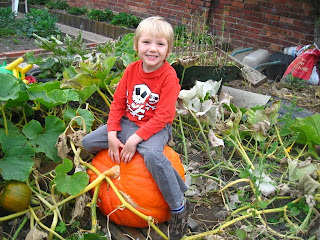 Our first orders for Halloween party products started coming in yesterday, so I thought it was about the right time to blog about them. We have plenty of Trick or Treat themed cellophane bags - perfect for use as Halloween party bags, or for filling with Halloween treats. 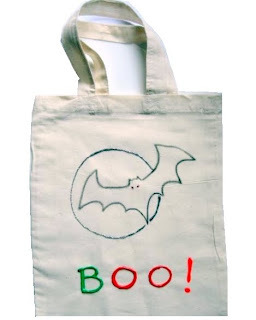 This year we're also stocking room decorations such as hanging bats, hanging spiders, and Halloween banners. 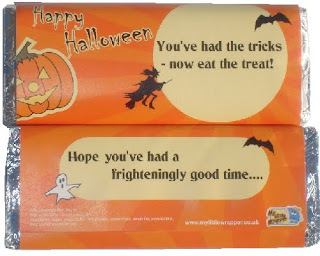 As you'd expect, we also have filled Halloween party bags, and party bag fillers, and if you really want your Halloween party to stand out from the crowd, how about our personalised Halloween chocolate bars?